2014 Nissan Sentra Pros and Cons: Why (Not) This Car? I reviewed the Nissan Sentra last year following a complete redesign. I found more things to like about the car than most reviewers did, but still found plenty of other things in need of improvement. Nissan has responded by improving a few of these things for the Sentra's second model year, so I'm giving it another look. Last time I compared the Sentra to the Honda Civic. This time I'm focusing comparisons on the Kia Forte, as it similarly prioritizes comfort and value over handling (for that, get the Mazda3 or perhaps the Ford Focus). 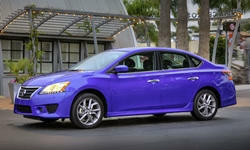 Why the 2014 Nissan Sentra? Aside from some speciality models that cannot be heavily optioned, the Sentra continues to top the rest of its segment in fuel economy, with EPA ratings of 30 mpg city, 39 highway. Well, almost. The new-for-2014 Mazda3 does a bit better with 30/40. Even with its base 1.8-liter engine the Kia Forte doesn't rate nearly as well, 25/36. If you want leather and such you're also getting the 2.0-liter engine, which is rated 24/36. The Sentra's trip computer substantiated its EPA estimates, and then some. On the highway cruising at 65 it reported a two-way average of 47 (up from 40 last year, probably due to warmer temps). In suburban driving the trip computer regularly reported averages of 36 to 37 (up from 32 last year), and on one run to my son's school with a very light foot on the pedals it topped 46. Cars have been getting nicer and nicer inside, and the Sentra doesn't buck the trend, at least not in the tested top-of-the-line SL. At first glance, the interior ambiance is "compact Lexus." Very conservative, with perhaps a bit much shiny plasti-wood trim, but decidedly more upscale than the class norm. At second glance, the materials and detailing support the initial impression (in sharp contrast to those inside the subcompact Versa). The door panels are cushily upholstered. One nit: the padded upholstery on the door panel is ungrained, but the hard plastic that abuts it on the instrument panel has a grained texture. The Forte's interior was upgraded for 2014, and most materials are about as nice as those in the Sentra. The Kia's body structure feels more solid than the Nissan's, and on the road it has the feel of a more expensive car. Its instrument panel remains hard plastic, though. When cruising, both the Sentra and the Forte are among the quietest cars in the segment. The Honda Civic, Mazda3, and Toyota Corolla all let in more road noise. This said, when accelerating the Sentra's engine sounds louder and buzzier than most competitors' engines. That the CVT often holds the engine at a contast rpm as the car acclerates doesn't help. Some of the changes for 2014 aimed to reduce engine noise via improved engine mounts and additional sound insulation. These changes have made some difference, but engine sound quality remains among the Sentra's weaknesses. Other changes for 2014 sought to improve both handling and ride quality. The impact on ride quality is mixed. Large dips and potholes don't upset the car's composure as much (it's still not the best in this regard), but the 2014 Sentra doesn't ride as smoothly over the small stuff as the 2013 did. Though still about as smooth as you'll find in the class, the Sentra is no longer the clear choice for people who want a traditionally soft ride in a compact sedan. The Kia's ride, though improved over the previous generation Forte, can still be more jittery than the 2014 Sentra's. Both the Sentra and the Forte can pack about 15 cubic feet into their trunks, which are among the most spacious in the class. The Cruze and Elantra hold about the same, and the Jetta can hold another half cube, but others fall a couple cubes short. The tested Nissan Sentra, an SL with Navigation and Leather Packages, lists for $22,460. Add the sunroof and Bose audio package, like on the 2013 tested last year, and the bottom line increases to $23,660. The Chevrolet Cruze and Ford Focus top out about $4,000 higher (though with additional equipment). Even a Kia Forte EX with the same features lists for nearly $2,000 more. But the Kia also includes a larger, more powerful engine and about $2,400 in additional features, including xenon headlights, power-folding mirrors, a heated steering wheel, ventilated power driver seat with memory, and heated rear seat. The Nissan looks best if you don't want to pay for these additional features, as you can't get leather and nav in the Kia without them (or without the sunroof). Don't want leather, nav, or sunroof? The base prices of the Sentra SL and Forte EX are only $215 apart (and $180 of this is for floormats on the Nissan). Interested in a car with fairly basic features like alloy wheels and cruise control? The Sentra SV and Forte LX with these features are priced only $5 apart ($19,320 vs. $19,315). This seems too close to be a coincidence. This said, the Forte includes about $900 in additional features. Overall, which one is the best value for you will depend on which features you want. Why Not the 2014 Nissan Sentra? Nissan did nothing to make the Sentra's engine stronger for 2014, so powertrain performance remains the top reason not to buy one. Aided by a continuously variable transmission (CVT), the 130-horsepower 1.8-liter four-cylinder engine motivates the 2,800-pound Sentra well enough, if much less quickly than the 173-horsepower 2.0-liter engine in the Forte EX, or the 184-horsepower engine in the pricier Mazda3 s.
But the CVT gets the most out of the Sentra's weak engine by revving it to a high rpm and holding it there. The way the CVT varies engine speed it has the feel of a slipping transmission. For 2014 Nissan has partially addressed this. If you accelerate for maximum efficiency or maximum acceleration, the transmission behaves the same as before. Under moderately heavy acceleration, though, it mimics a conventional automatic transmission, gradually increasing engine speed, then dropping it, then gradually increasing it again. Also, as noted above, changes have been made to reduce (but not nearly eliminate) the unseemly racket emanating from beneath the hood. Most of the tweaks for 2014 addressed reviewers' complaints about the 2013 Sentra's numb steering and dull handling. The 2014 car's steering is quicker and feels a little less numb, while the suspension better restrains roll in turns and body motions over bumps, partly at the cost of ride quality (as noted above). It's about a match for the Kia now, and might even have a bit more feel to the steering. But neither car is much fun to drive. For that, you'll still want a Mazda3 or Ford Focus. On the subject of compact cars, legendary GM designer Bill Mitchell once quipped, "It's hard to tailor a dwarf." While it's certainly possible to design an attractive small car, if you simply shrink the design off a larger one the end result tends to suffer from dumpy proportions. Even the 195-inch-long Infiniti M appears stout when not fitted with the optional 20-inch wheels. The 192-inch-long Altima barely manages to pull off M-inspired (if simplified and leaner) curves. It's no beauty. The Sentra, with lines much like the Altima's but with nearly ten inches less length AND an inch more height, is Mitchell's dwarf. From some angles it appears elegant, from others it looks like a portly kid dressing up in daddy's clothes (if not quite the parody of a large luxury sedan that the narrow, 175-inch-long Versa is). The Sentra's best angle is directly from the side. A large chrome grille reeking of less-than-tasteful upward aspiration dominates the front view. With an unusually rectangular shape and muffin top tail lamps, the Sentra's derriere looks--is there a delicate way to put this?--graceless. There are uglier cars. But there are also much prettier ones. The prettier ones include the swoopier Kia Forte. If you do want those additional features available on the Forte, then the Sentra is out of the running. Same goes for some of the features on the new Mazda3, including steering-linked xenon headlights, a head-up display (HUD), a blind sport warning system, a lane departure warning system, and low-speed automatic braking. 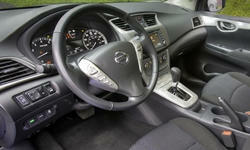 The Sentra's interior might have an upscale appearance, but it doesn't offer many upscale features. Or even a power driver seat. The Nissan Sentra offers a smooth, quiet ride and about as much passenger (and cargo) room as you'll find in a compact sedan. Open the door, and the SL's leather-trimmed interior appears luxurious. Sit down, though, and the illusion crumbles. Unlike those in the Altima, the Sentra's flat, firm seats provide little in the way of comfort or support. A tilt adjustment for the driver seat would help, but one is not offered. Revised front seats elevate comfort to passable. The Forte's front seats remain a little more comfortable, while some others (such as those in the Mazda3 and Focus) feel considerably better. Last year I also had issues with the Sentra's driving position, wishing I could lower the front seat and further extend the steering wheel. I'm not aware of any changes in these areas, but did not note these issues this year. The Forte has different driving position issues. Rather than a high instrument panel, it has a very deep one, thanks to the steeply raked windshield. The Sentra's rear seat offers a little more rear legroom than the Forte, and much more than in the Mazda3 or Focus, but not as much as in the Corolla and Volkswagen Jetta. The seat is more comfortably positioned than most. As a result, tall passengers might find headroom in short supply. The Forte does offer rear seat passengers one advantage: rear air vents. The changes Nissan made for the 2014 Sentra do make a difference, but not a dramatic one. A couple of former "why not to buys" have been improved to adequate, but some competitors remain superior in these areas, as well as others where the Sentra continues to have clear weaknesses, most notably powertrain performance. Like last year, the Sentra remains a viable choice if want a roomy, smooth, quiet car at a relatively low price. Especially if you prefer its styling, which is more traditional than that of most competitors. If, on the other hand, you want a car that is exciting to look at and drive, or that is loaded with the latest features, other compact sedans remain better options. Nissan provided an insured car for a week with a tank of gas. Kia provided an insured, fueled car at a media association event. 2014 Nissan Sentra pros and cons, according to Michael Karesh: the best reasons for buying (or not buying) the 2014 Nissan Sentra. Join TrueDelta to post your own impressions.